7-11 customers donated 19 Cases of Pizza on 11/6/2014! to feed our active military and local shelters. They were all very blessed. Thank you!!! PAX are given out to the homeless. A donation of $5.00 buys #2 PAX. in the Name of LINKS Inc. The Columbian (Vancouver, WA Newspaper) featured LINKS on its front page "LINKS keeps finding ways to feed people". Click here for a PDF of the article. LINKS was begun as the vision of George Golden who serves as CEO. Because serving the poor is a passion, he is actively involved in all aspects of this service. 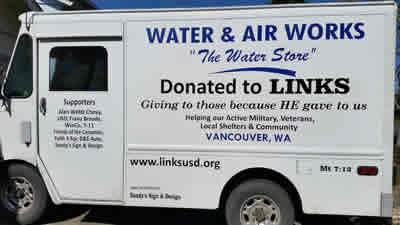 LINKS has been working to serve our community and those in need in a number of ways since 2009. LINKS volunteers have been involved in the Mayor's Prayer Breakfast for 10 years and the Vancouver All Church Picnic for three years. LINKS began as a community service project serving with the assistance of local businesses, churches and non-profit charities. It was brought together to respond to the need for emergency food for families. We have been able to see this happen as we served law enforcement agencies and school districts to meet the needs of our neighbors in crisis situations. First, we supply community service organizations with a stock of food boxes they can use to meet emergency needs. These organizations include local Schools, local Law Enforcement, Veterans’ organizations, local Churches, and more. This enables the staff to directly provide food to families in an emergency. LINKS will replenish the organization’s supply, at their request, without any paperwork or delay. Second, Links supplies food for immediate needs to individual families in emergency and crisis. We refer those with on-going needs to the appropriate community organization. Perishable foods (i.e. sandwiches and salads) are given to day shelters such as Share House, Open House, Friends of the Carpenter, Freedom House and Clark County Veterans Center. We also service our active military at USO at Portland Airport and the Army Service Center which serves active Army, National Guard, Marine Corp, and Navy with food for their needs which is not supplied. 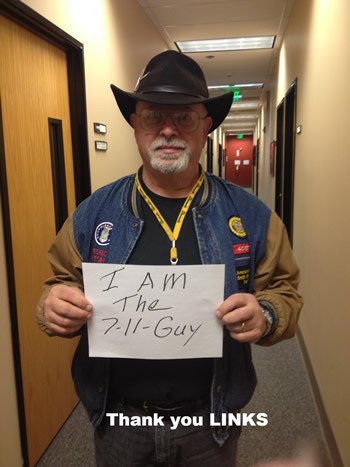 Thanks to a major donor - 7-11! 7-11 donates their "pull-dated" items (i.e. hoagies, fruit, sandwiches, salads, donuts, etc.) The customers have an opportunity to participate by purchasing a pizza to donate to the program. These are stored and picked up with the regularly scheduled pick-ups. Note: These supplies helped feed the troups at the Oso tragedy. Demonstrating the love of God in practical ways to individuals and families in emergency and crisis. 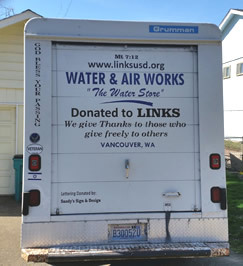 We are VERY thankful for the Van that was donated to LINKS by Water & Air Works. You may also use the Donate button above.